According to self-reported data from the 2014 General Social Survey on Victimization (GSS), one-third (33%) of Canadians aged 15 and older experienced some form of maltreatment during childhood. Child maltreatment includes physical and/or sexual abuse before the age of 15 by someone aged 18 or older, as well as witnessing violence by a parent or guardian against another adult. Police-reported data from the Uniform Crime Reporting Survey and the Homicide Survey report that children and youth (under the age of 18) accounted for 16% of victims of violent crime in Canada in 2015. Of this group, 30% were victims of family violence—acts committed by parents, siblings, extended family members, and spouses. Detailed results are provided in the Juristat report "Family violence in Canada: A statistical profile, 2015." The section "Profile of Canadian adults who experienced childhood maltreatment" presents an analysis of the experiences of childhood physical and sexual abuse and witnessing parental violence reported by Canadians aged 15 and over. Additional sections present an overview of police-reported family violence, including a focus on intimate partners, children and youth, and seniors. Experiencing physical and/or sexual abuse at the hands of an adult before the age of 15 was reported by 30% of Canadians aged 15 and over. 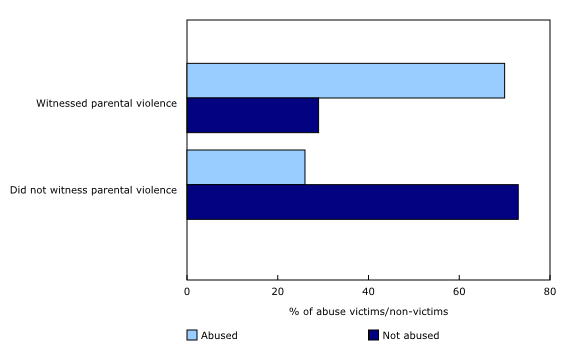 Physical abuse was the most common form of child maltreatment, reported by about one-quarter (26%) of Canadians. Meanwhile, childhood sexual abuse was reported by 8% of people in Canada aged 15 and over. A smaller proportion (5%) said that they had been subjected to both physical and sexual abuse during childhood. Overall, childhood physical and/or sexual abuse was more common among males (32%) than females (27%). Men aged 15 and older reported childhood physical abuse more often (31%) than women (22%), while women were three times more likely than men to report childhood sexual abuse (12% versus 4%). Most victims (66%) of childhood physical and/or sexual abuse reported that they were abused between 1 and 6 times, 20% reported between 7 and 21 instances, while 1 in 7 victims (15%) reported that they were abused more than that. The vast majority of victims (93%) of childhood physical and/or sexual abuse did not speak to either the police or child protection services about their experiences before they turned 15. About two-thirds of victims (67%) did not speak to anyone, including friends or family. About 10% of Canadians stated that as a child, they had witnessed violence by their parent or guardian against another adult. A large majority of child witnesses—7 in 10 (70%)—also reported that they had been the victim of childhood physical and/or sexual abuse. Childhood sexual abuse was most often perpetrated by someone outside the family. In particular, someone other than a relative was identified by four out of five male victims as the person responsible for the most severe instance of sexual abuse. Among female victims, 54% indicated that their abuser was a non-relative. A parent was identified as the person responsible by about 1 in 10 (11%) childhood sexual abuse victims. In contrast, most victims of childhood physical abuse indicated that a family member was responsible for the most serious instance. Specifically, just over 60% of victims reported that the most serious instance of abuse had been committed by a parent, including about 7 in 10 (71%) female victims and just over half (54%) of male victims. Overall, 40% of Aboriginal people were the victims of childhood physical and/or sexual abuse, compared with 29% for non-Aboriginal people. However, this difference was found only among those aged 30 or above. 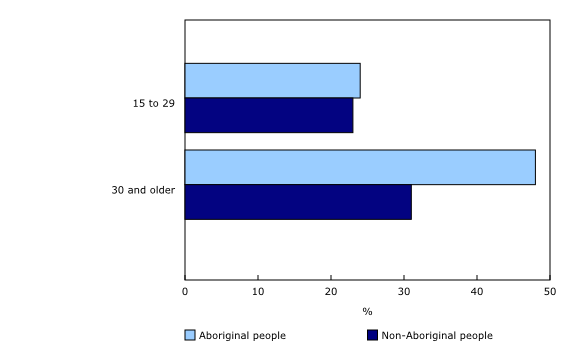 Among those in this older age group, almost half of Aboriginal people reported physical and/or sexual abuse compared with 31% of their non-Aboriginal counterparts. Aboriginal women aged 30 and older were more likely to have been victims of childhood physical and/or sexual abuse (49% compared with 28% of non-Aboriginal women), as were Aboriginal men (47% versus 35% of non-Aboriginal men). Of note, there were no differences between Aboriginal people and non-Aboriginal people when it came to the prevalence of childhood physical and/or sexual abuse among those aged 15 to 29. Just under one-quarter of each group reported childhood physical and/or sexual abuse, something which held true regardless of gender. The analysis in this report could not take into account the impact of residential schools on Aboriginal families and communities, as this information was not collected. Those who reported a history of childhood physical and/or sexual abuse were more likely to experience a range of negative outcomes in adulthood. Under 1 in 10 (7%) of those who were physically and/or sexually abused as children reported that they experienced violent victimization as adults during the 12 months preceding the survey. This proportion was almost double that reported by people who had no history of child abuse (3%). In addition, after controlling for other factors, victims of childhood physical and/or sexual abuse were at a higher risk of being the victim of both spousal and non-spousal violence later in life. Similarly, adult victims of childhood physical and/or sexual abuse were more likely (10%) to report a mental or psychological disability or limitation than non-victims (4%), and were more likely to report poor physical health (14% versus 9%). Of note, when it came to key socioeconomic elements such as education, employment and income, very few differences were found between people who had experienced abuse as children and those who had not. In addition to self-reported data from the GSS on Victimization, police-reported data provide additional insights into the nature and extent of family violence in Canada. According to police-reported data from 2015, children and youth (under the age of 18) represented 16% of victims of violent crime in Canada. Of these victims, 30% were victims of family violence—acts committed by parents, siblings, extended family members or spouses. Among child and youth victims, 59% were female, and the rate of family violence was highest at age 15 for both females (495 per 100,000 population) and males (252 per 100,000 population). Parents were most often (58%) the perpetrators of police-reported family violence against children and youth, followed by extended family members such as cousins or grandparents (22%) and siblings (17%). Victimization by a parent (84%) was most common among the youngest victims (under one year of age). Physical assault (all levels) was the most common form of police-reported family violence against children and youth (58%), followed by sexual offences (31%) such as sexual assault (all levels), sexual interference and luring a child via a computer. Females were between four and five times more likely (119 per 100,000 population) to experience sexual offences than their male counterparts (27 per 100,000 population). Overall, the rate of family-related sexual assault against children and youth declined by 21% from 2010 to 2015. In addition to crimes involving child and youth victims, family violence can involve crimes against adults, including intimate partners and seniors. In 2015, there were over 322,600 victims of police-reported violent crime in Canada and, of these, just over one-quarter (26%) were victimized by a family member. Overall, about two-thirds (67%) of victims were female. Rates of family violence were highest for female victims aged 30 to 34 years (576 per 100,000 population) and male victims aged 15 to 19 years (228 per 100,000 population). Nearly half (47%) of all victims of police-reported family violence were victimized by a current or former spouse. In other instances, parents (17%) and extended family members (14%) were identified as the perpetrators. Physical assault (73%) was the most common form of police-reported family violence, while 8% of victims experienced sexual offences such as sexual assault (all levels) and sexual offences such as sexual interference and luring a child via a computer. Overall, rates of all types of police-reported family violence were higher in the territories than in the provinces, with the highest rate reported in Nunavut (2,504 per 100,000 population). Among the provinces, Saskatchewan (480) and Manitoba (374) reported the highest rates of family violence, while Ontario (150) and Prince Edward Island (154) reported the lowest. While the Canadian rate of police-reported family violence was relatively stable from the previous year (-0.8%), Yukon (-17%) and Nova Scotia (-11%) reported declines. The report "Family violence in Canada: A statistical profile" is produced by the Canadian Centre for Justice Statistics under the Federal Family Violence Initiative. It provides the most current data on the nature and extent of family violence in Canada, as well as trends over time, as part of the ongoing initiative to inform policy makers and the public about family violence issues. Using data from Cycle 28 of the 2014 General Social Survey (GSS) on Canadians' Safety (Victimization), this year's report presents an analysis of Canadians' experiences of victimization during childhood before age 15, as well as their later experiences with victimization, justice system involvement, community belonging and other aspects of adult life. Child maltreatment includes physical abuse by someone aged 18 or older (ranging from slapping and hitting to punching and choking), sexual abuse by someone aged 18 or older (ranging from sexual touching to forced sexual activity), as well as witnessing violence by a parent or guardian against another adult. The target population of the 2014 GSS consisted of people aged 15 and older in the provinces and territories and excluded people living full time in institutions. People residing both on and off reserve were in scope for the survey. It is important to note that analysis specific to small sub populations may not be possible due to small counts. The report "Family violence in Canada: A statistical profile" also presents information on incidents of family-related violence that was brought to the attention of the police. Police-reported data for the provinces and territories are gathered by the Incident-based Uniform Crime Reporting Survey, which is an annual census of all violations of the Criminal Code and certain other federal laws that come to the attention of the police and that the police have substantiated, and by the Homicide Survey, which collects information on all culpable homicides in Canada. Although these three surveys cover similar themes, they have numerous differences in terms of survey type, scope, coverage and data sources. As a result of these differences, these surveys provide robust and complementary information on family violence in Canada. The Juristat article "Family violence in Canada: A statistical profile, 2015" (Catalogue number85-002-X), is now available.